When I build a burger, I like to make it a “how wide can you open your mouth” challenge. I love fully-loaded burgers with lettuce, tomato, onion, and cheese and the messier the better. If I don’t go through three or four napkins, I haven’t had the full hamburger experience. Often, eating burgers with my hands becomes a hopeless situation and I’m forced to grab a fork! I’ve created a fully-loaded burger on steroids for today’s post. 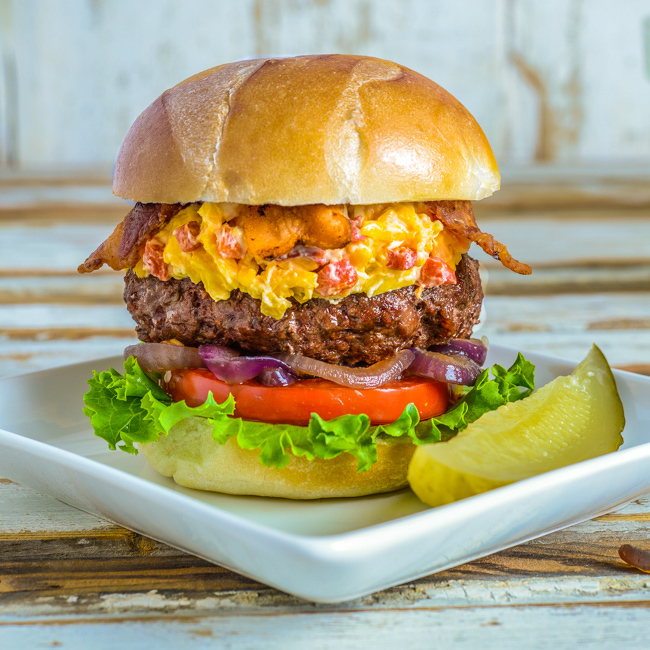 Pimento cheese, a southern staple spread, takes this burger to a whole new place and bacon and sauteed red onion perfectly compliment the cheese. I’ve made 8 ounce patties for these burgers, but I realize that’s a man-sized serving. You can certainly make smaller patties if you have a smaller mouth and a smaller appetite and can’t handle my 3-inch burgers. Burgers are customizable so feel free to alter the ingredients to your taste. We’re fortunate enough to have a couple more months of grilling weather in Atlanta so I thought I’d post one more grilled recipe. If cool weather is already making it to your area, you can use a grill pan for these burgers. 1. In a medium bowl, combine cheddar cheese, goat cheese, cream cheese, 1/4 cup mayonnaise, onion, 1/8 teaspoon salt, sugar, tabasco, and pimento peppers using a fork. 2. Heat olive oil in a medium skillet over medium high heat. Transfer onion to skillet and saute for 4 to 5 minutes until wilted and browning. Toss regularly while sauteing. 3. Set onions aside and cook bacon in same skillet until brown and crispy. Drain on paper towel and break each slice in half. 4. Preheat gas grill or grill pan to medium high heat. 5. Combine ground chuck, 1 teaspoon salt, and pepper in a medium bowl. Do not overwork the meat. Divide into 4 portions and flatten. Make an indention in the center of each patty before cooking. 6. Grill patties for 3 to 4 minutes on each side until internal temperature reaches 130 degrees for medium rare or 140 degrees for medium. Remove patties and cover with aluminum foil for 5 minutes. While burgers are resting, place buns on grill for 45 seconds to 1 minute on each side. Watch carefully so you don't burn buns. 7. To assemble burgers, spread mayonnaise and mustard on each bun. Place lettuce leaves on bottom of each bun and top with a tomato slice. Top tomatoes with sauteed onions and burger patties. Add pimento cheese on top of burgers and top with bacon halves. Place bun tops on burgers and serve immediately. If a pimento cheese burger isn’t Southern, then I don’t know what is. I’d love to open wide and sink into this one. Wow! So glad I found your blog a few months ago. I have tried several recipes and they have all been great! This is up for the weekend….from a former Mississippian. Bill – I don’t even eat beef – but this is looking mighty mouthwatering! Believe it or not, I haven’t tried pimento cheese yet – maybe time to try? Yipes — I’d gladly unhinge my jaw for this one, Bill! YUM! Wow! That is one fully loaded burger for sure, and I have to say that burgers are one of my favorite foods. I bet the pimento cheese is great here. Thanks for the inspiration! I live in Los Angeles, and we have a few more months of grilling weather too. Around the country and in Europe people are talking about fall and writing about cooler weather foods, but I’m still into summer, and it looks like you are too! I planted a pimento pepper plant back in June and today I picked my first red pimento. The plant is loaded and if I can get more to turn before the first freeze, we’ll be making these burgers with that pimento cheese! I love pimento cheese, but haven’t had it in ages. I can’t wait! That picture has my stomach growling. Oh no you didn’t! This thing is CRAZY yummy looking Bill. I am salivating. I love the idea of needing a fork and knife! Pinned! Thank you, Katie. I know this burger wouldn’t be on your regular dinner rotation, but it’s fun to splurge sometimes, right? Wow, what a great burger. For a southerner it doesn’t get much better than pimento cheese. Fabulous job on the burger photo Bill.